HP’s new DeskJet GT 5820/10 All-in-One series is targeted at high-volume home users looking for a wireless ink tank printer that never stops. The series makes high-quality, reliable printing more affordable and wireless printing and ink refill easy and hassle-free. 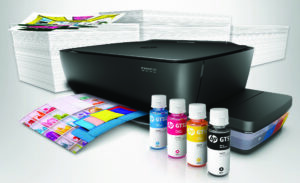 The printer series prints up to 8000 pages with a set of three HP colour bottles, or up to 5000 pages with a HP black ink bottle out of the box. Original HP inks are formulated to deliver sharp text, vibrant graphics and photos that resist water and fading, and produces professional quality, borderless printing. Replenishing ink is also clean and easy with the company’s spill-free refill system. The bottles can simply be plugged into the tank without any squeezing required. Users can also monitor ink levels with the transparent ink tanks. The HP DeskJet GT 5820 All-in-One printer adds wireless capabilities that make it easy for users working remotely to connect via smartphones and tablets. Even without a wireless network, WiFi direct enables users to directly connect their printer to the mobile device at home.